Fortunately I had only flown from my airport (JZI) to Mt Pleasant Airport (LRO) which was just a short 10 minute flight. The plane flew fine on the way over and developed the problem with no warning at all. Luckily, one of the flight instructors flew me back to my airport to get my tools and a spare finger filter to fix the the bird and after a short 30 min installation life is good again. Once again as before, I had a problem with this FINGER FILTER. which is a major single point of failure on most canard AFP installations. Basically, AFP/bendix has 3 filters inline to protect itself. The filter supplied with their fuel pump is 125 micron (protects the pump). The fuel servo finger filter is 75 micron has about ONE square inch of filter area. This is pathetic. There is a third one in the spider which again is 75 microns with about 3/4″ sq inch of filter area. IF you get a load of crap in your fuel (for me…. ?? the first time, rust the second time, now fine dust) your plane goes down. All the fine stuff just flows through your fuel pump filter (125 micron) and accumulates in the finger filter 75 micron) or possibly in the spider filter until they totally clog up. Honestly, It takes next to nothing to clog these tiny filters. After talking to Kevin at AFP (and Klaus) about the issue I found out there is an alternate way of plumbing the fuel system which will eliminate this single point of failure. Just install a finer micron filter PRIOR to the finger filter on each tank outlet so it clogs first to protect the finger filter, duh… This is NOT how we plumb our planes, nor is it discussed in the AFP manual. 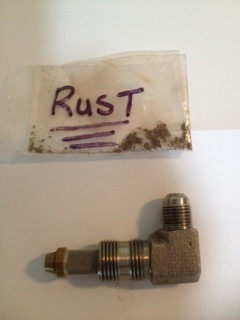 Kevin told me this alternate fuel filter installation is very routine for RV airplanes and makes sense for ours too. AFP even sells their fuel pump system without the 125 micron filter on it for the RV group. Summit Racing sells a 63 microns filter with AN fittings with a HUGE amount of filter area (the filter is 12″ long). Allstar Performance filter #40218, $61. The reason for such a massive filter area is that being installed on the suction side of the fuel pump you want a large surface area so you do not reduce suction pressure to ensure the fuel doesn’t vaporized prior to the pump. There is no way this large filter (approx 20 sq inches of filter area) could restrict inlet pressure unless it was massively plugged. If one does plug one up due to crap, (instantly recognizable due to low fuel flow) you switch tanks and use the other filter. You protect the finger filter, the engine produces power, you keep flying, the FAA is happy. Here is a couple key point if your building, planning, or flying a AFP or Bendex system. 1. Consider the problems of this single point fuel failure and what can be done to prevent them or eliminate them. Happened to me 3 times in a year, it could happen to you too. 2. When taking off, be sure to include fuel flow in your scan. The fuel pressure will be normal, but the fuel flow will decrease from about 12 gph on take off to 6-7 gph at full power setting. If a fuel flow reduction occurs, retard the throttle which reduces air into the engine and about 2000 rpm the air/fuel mixture will be correct, and engine will smooth out and you can safely make it home. Dont panic. 3. I plan to carry my spare AFP finger filter with me in the plane at all times in case I get another load of crap in the fuel. The finger filter is $75. Cheap insurance. If this happened on my recent 2800 mile trip to Burralls flyin, there would have been a much different outcome. 4. Every annual, I’ll remove the finger filter and have it professionally cleaned. BTW, you can buy a ultrasonic cleaner at Harbor Crap…use soap and water and blow it out. For the cozy 3 I am building as well as another builder know (cozy 4) we are plumbing both fuel systems with 2 inline 63 micron filters immediately after the fuel tank outlets. The stop valves allow you to secure the fuel from each tank for servicing the filters. Klaus recommends just fly them until the point one side plugs up and only then, remove and clean the filter. One would think having fuel injection solves all your problems…. no carburetor icing, great mixture control, the best fuel system you can put on your bird. Life is great. The one big issues is a fuel injection is very unforgiving about is dirty fuel which has lesser affect on a carburetor. Hopefully, this post will make you think about your installation and possible issues of the plans type fuel system installation.